How Long Until Our Entire Lives Go Digital? No one can deny the impact technology has had on human lives, in particular, the Internet. A lot of this has been highly beneficial, making our lives far easier. Some of these inventions look like things from sci-fi films of the past, and I often wonder how long it will be until we have the technology we dream of in more recent films. The Internet allows us to see people on the other side of the world as if they were in front of us, access any information in seconds and purchase nearly anything we want. It is also a great platform for new talent, particularly in the music industry. It is impossible to not use it, particularly in the work world, where everything requires a computer of some sort, even if it is only used for something as basic as email. However, I, like many others, sometimes miss simpler times. So many of us are reliant on our computers, phones and other gadgets, myself included. We compulsively check Facebook and Twitter, often before doing anything else in the morning, and ‘just Google it’ has become the standard response for any unanswered questions we may have. I have found it possible to write entire university essays using online journals, without entering the library. And emails are quick and easy, but who wouldn’t love to receive a hand-written letter in the post nowadays? Children are growing up entirely computer literate, which will be beneficial in our modern, digital world, but really, why do eight year olds need smart phones? Children should spend their youth discovering the world first hand, exploring what is around them, and not doing it through a screen. My biggest pet hate is the digitalisation of films, music and especially, books. I understand why it is easier to have all these things in one place, and that they are now much more portable. I certainly would not part with my iPod easily. However, I am a romantic, and I like having collections of things I can see and hold. I have boxes of CDs and shelves upon shelves of books, and there is just something so much nicer about them than one little electronic device. I do upload my CDs onto an iPod, as I like playlists and mixing up what I’m listening to, but I prefer having physical copies for peace of mind – I’ve seen too many computers crash and hundreds of files get lost. As for books, I hate e-readers. Reading anything electronic for too long hurts my eyes, and you can’t mark pages or make notes or underline quotes on an e-reader. Books are much more personal, and I like that everyone’s copies are unique to them, even though the story inside might be the same as another’s. 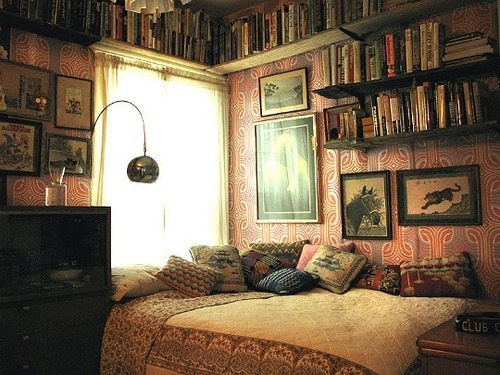 They are also wonderful for decorating a room, displaying collections of the art (literature, music, films) that you love. It disgusts me how many of my fellow literature students use e-readers, when we of all people should be first in defending traditional books. And despite portability benefits, I would still carry a heavy tome around rather than an electronic version, as it’s just not the same. Maybe I’m in denial, but I sincerely hope that we can preserve these things. I am pretty reliant on my electronics, but I hope I never let my entire life go digital. We’ve already come close to losing HMV, let’s not send Waterstones and our libraries the same way.